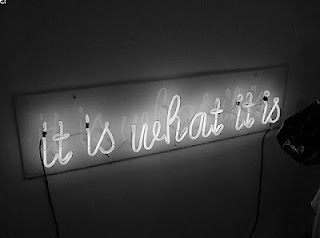 It is what it is...until it's not. In my 38 years on this planet, I have been alive and kicking long enough to see the cycle of collective cultural catch phrases. Remember, "rad," "cool," "sweet," "gag me with a spoon," "tubular," "where's the beef," "wicked," and the still ever present peppering of "like" through every sentence? There are some phrases that are banned from adult use. A few months ago, a similar-aged friend and I were trying out her teenage daughters' newest saying, "like a boss," only to be given eye rolls of epic proportions and being chastised for saying it wrong and for even trying to say it in the first place. Young people only. Meaning...we're old. Yeah, we get it. However, there is one catch phrase that I seem to hear everywhere now -- from young to old -- and it's driving me nuts. I even hate to type it here. Okay...here goes.